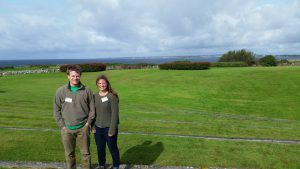 Graduate student researchers Ian Gagnon and Kaelin Chancey participated in the International Network on Offshore Renewable Energy (INORE) European Symposium in Co. Clare, Ireland the week of August 21, 2017. Ian presented a poster about his contributions to the Living Bridge Project over the past two years including the tidal energy resource assessment and design of the turbine deployment platform. Kaelin gave a poster presentation focused on the estuarine instrumentation installed on the turbine deployment platform. She also gave a talk about the entire tidal turbine deployment system located at the Memorial Bridge which was named the best presentation of the conference. 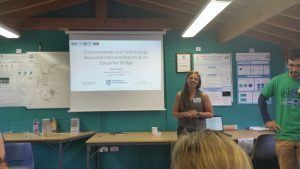 The researchers were also able to tour many of the marine research facilities located on the west coast of Ireland and network with other early stage researchers from around the world.